11 March 2019, Hong Kong – Sanlorenzo Asia, represented by Simpson Marine, is delighted to announce a new partnership with Sanlorenzo and Steve Leung. Having previously collaborated on an Asia-infused project for a Sanlorenzo SL106, the teams are together again with a focus on the new crossover model – the SX88 – introduced by the shipyard at the Cannes Yachting Festival 2017, since when the SX88 has forever changed the perspective on how life at sea is enjoyed. Established in 1958 in Liguria and Tuscany and comprising of four facilities in Ameglia, La Spezia, Viareggio and Massa, Sanlorenzo is one of the most prestigious motoryacht and superyacht builders in the world, dedicated to designing and building the highest-quality yachts on the market. In over 60 years of the company’s history, the shipyard has manufactured more than 900 yachts and is now among the top three yacht builders in the world for yachts over 24m. Sanlorenzo’s company focus is on building the most exclusive, quality-driven yachts that reflect each and every single owner in unique, distinctive ways. In 2017 the shipyard introduced a new range to its fibreglass Yacht Division, comprising until then the planing SL range and semi-displacement SD ranges, adding the crossover SX (Sport Explorer) range inspired by the new ways that yacht owners wish to live their lives at sea – highlighting exploration and freedom as new lifestyle concepts. First in the SX line, and currently its flagship, is the SX88 representing a successful and clever combination between classic flybridge yachts and recently expanding Explorer superyachts that Sanlorenzo introduced as first on the market with the superyacht 460EXP and 500EXP currently cruising worldwide. Sanlorenzo joins hands with the world’s most renowned designers to create unique yachts for their owners. This time the partnership has been established with Steve Leung. The first collaboration step with him began in December 2016, with the development of the SL106 Asia Edition project. An award-winning architect, interior and product designer, Steve Leung is the Founder of Steve Leung Design Group, headquartered in Hong Kong since 1997. Currently one of the largest interior design practices in Asia, with a striking record of 130 international awards, the Group has offices in Beijing, Shanghai, Guangzhou and Shenzhen, with a strong team of over 600 talented designers and professionals. After the first collaboration on the SL106 project, the companies felt that there was a way to extend further to a more mature project fully suitable to the fast-evolving and demanding Asian market. This second step has found its ideal platform in the SX88, a vessel that indeed represents a concept well suited to modern Asian buyers seeking a more social way to utilise their yachts. 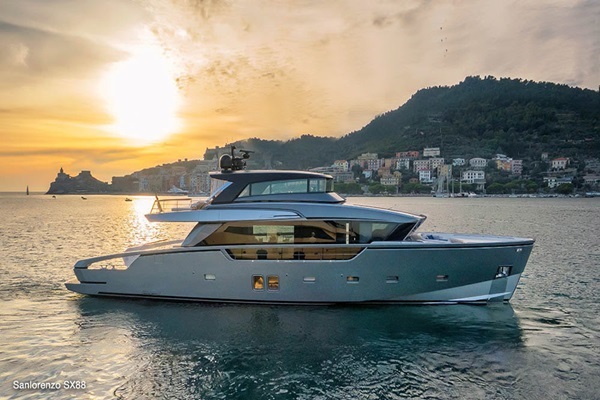 With large open spaces, a fully open aft platform allowing for storage of numerous water toys or outdoor furniture, floor to ceiling glass walls and a modern silhouette, the SX88 is the perfect offering to the Asian market. The designer developed two initial concepts with the main salon becoming one generous open space, emphasising the large windows of the SX88 and forming a central social hub that transitions seamlessly to the yacht’s exterior. The visually connected, yet physically separate, dining area facilitates both a casual and intimate dining experience during daytime and in the evening. The lower deck encompasses an impressive master suite, one VIP Suite and the option to add a twin guest cabin. Various configurations are possible, as with all Sanlorenzo yachts. Two tailored interior design schemes are dedicated for the SX88: the first option ‘Breeze/Zen’ featuring relaxed earthy/blue/emerald green shades to create a sense of immediate serenity. This is enhanced by the selection of deep, comfortable furniture with textured fabrics; the second option ‘Vermilion’ is designed for more daring owners which draws inspiration from circular, stronger shapes and colours, featuring reds and oranges complemented by soothing creams and beiges. For both options, only bespoke and the most precious materials have been used as finishing touches. “Following the great success of our first collaboration with Sanlorenzo, I am elated to join forces with Sanlorenzo and Simpson Marine once again. By adopting a contemporary design style infused with the finest details in forms, lines and colours, we hope to establish another new take on yacht design through a flawless integration of international lifestyle with local cultural features, paired with a perfect balance of aesthetics and functionality, suitable for the needs of the Asian market”, explains Steve Leung. “Working with Steve is a delight and we are fortunate to have such expertise right here in Hong Kong. Steve himself is a keen yachtsman, and this is clear to see in his ability to break the mould yet at the same time design a yacht that is practical to use and hits perfectly the market in Hong Kong and the rest of Asia. A deep understanding of how clients here use their yachts is instrumental in knowing the functions they require. The SX88 is a yacht that allows your imagination to run wild, incorporating a completely open main deck and the ability to have a number of layouts on the lower deck. Steve is not only able to work with clients on the SX88, but also on the whole range of yachts we offer as every Sanlorenzo is a tailor-made and unique creation”, says Nick Stratton, Sanlorenzo Asia Sales Manager. Since May 2015, Sanlorenzo has been exclusively represented in Asia by Simpson Marine, and resultant growth of the brand has been significant, with many new and experienced yachts and superyachts delivered to Asia including highlights such as the new SX76, the SL102 Asymmetric and expedition 500EXP superyacht. A number of yachts are currently under construction with owners recognising the huge leap in quality and refinement over the more mass-produced offerings in the market. The project will be further disclosed at the Singapore Yacht Show, held on 11-14 April 2019. Sanlorenzo will have a number of Asia Premieres with the new SL86 and SD line flagship, the SD126. The partnership announcement coincides perfectly with the recent arrival in Hong Kong of a new SX76, presenting the SX line for the first time in Asia, before an SX88 joins the fleet in Autumn 2019. Following this latest collaboration on the SX88, Steve Leung will also contribute his rich expertise to other Sanlorenzo yacht ranges, including SX, SL, SD and Superyacht collections.